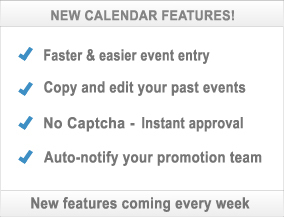 NOTE: Use these two boxes below to start with a venue or event you�ve already posted. To load something entirely new, skip these boxes and go to the next section. Be specific so search engines can find your events. 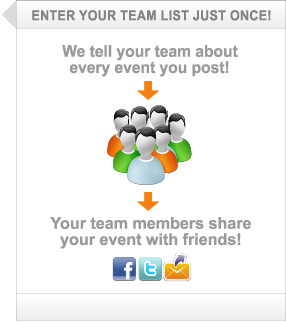 Let your employees, helpers, and friends spread the word about your event. This event and your future events will be emailed to your network. The email will remind everyone to hit the LIKE button, post the event, and forward the email. Enter up to 75 addresses. The system will save your list for future events. Robots have been running rampant lately. Please let us know you're a human by typing "Human" in the box below. Please let us know you're a human.